Welcome to mniwideroleplay, a Livejournal community for all the roleplaying that goes on at Mugglenet Interactive. Yes, all. Whether you're an Order member, a Death Eater, a Ministry personel, or even a random shopper in one of the many kooky places in the Roleplay Forum, you are welcomed here. So you can pretty much post anything here that has to do with roleplaying on MNI. You can discuss future plans for your character(s), especially if it's going to be an MNI-wide thing, you know? Or you can start a post and talk about a past roleplay that you really liked or found interesting, etc. You can ask for advice on character development, you can make suggestions about this or that or him or her (but play nicely), and you can make summaries of your roleplays. That'll probably come in handy, because there are times when you come back from a break and you're like, "What the hell, what happened? How come...?" And now that won't have to happen anymore, because of this handy-dandy community. And you know what, if you want, you can even post all the graphics you've made for your characters--share the love, get feedback, whatever; it's all good. 01. Don't piss off the mods. 03. No, really, though: don't. 05. Post relevent subjects. i.e. If it doesn't have to do with roleplaying on MNI etc., it doesn't belong here. 07. Try to be active. 08. Try to promote. Get your roleplaying friends to join us here. 10. We love you. Have fun. This is very important. Please read thoroughly. Alrighty, so this is the way tagging works in communities: only the mods are able to create new tags. I apologize for previous confusion. If your username is not on the list, this is most likely because you have not posted in the introduction post, so please make sure you do so. 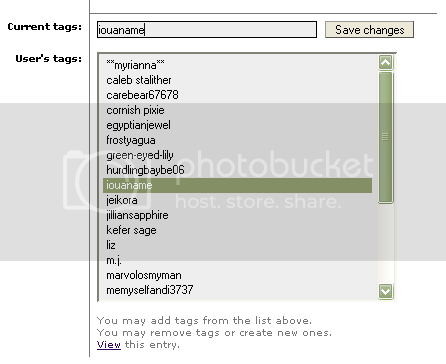 Also, the tags function will now only be used for members' usernames. Tags such as "future plots" and "polls" will now be replaced by the memories function, so please go check that out. Please promote this community to your roleplaying friends on MNI! Have suggestions, questions, or complaints specifically about this community? Comment here.